My husband and I began looking for a German Shepherd puppy after our devastating loss of our seven year old chocolate lab; Harley to lymphoma cancer. After countless weeks and hours upon hours of research and corresponding with different breeders we found Gretchen. My first "look" at Gretchen came in the form of a photo her breeder sent to me via e-mail. To say I was a goner from the get-go would be an understatement the second I looked at her photo. However my husband and I cautiously left this as a "We'll see." Gretchen's breeder and I spent nearly two full days interviewing each other (phone and e-mail) and checking each other references. Once this was done we set up a time to drive nearly three hours to meet Gretchen. At this point I had already purchased Gretchen a nice dog bed, countless toys and some healthy training treats and found Total-German-Shepherd.com ... you know.. Just in case because we were still at "We'll see." 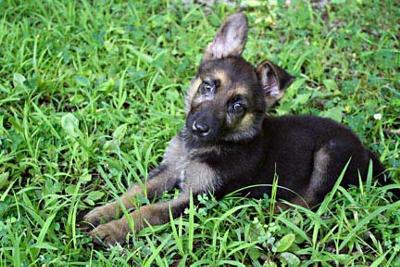 for in a GSD she has a wonderful, caring breeder that will stay very dedicated to our new girl and us as we share our home with our first German Shepherd. she wondered too far away. Once all the official work was done my husband wanted to see if Gretchen would follow us to our car; she not only followed us, she nearly beat us to the car and never gave one look back. At the time of this writing, we have had Gretchen only four days but in that short time she has wrapped herself around our hearts. Her housebreaking is going great and at 10 weeks of age she has already learned her name, will sit on command and knows "come" flawlessly.